German M43 Luftwaffe Service Pants Wool - WWII Reproduction. 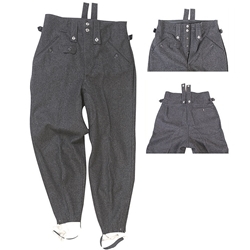 This is an accurate reproduction of the Luftwaffe pants as used by pilots, field soldiers and paratroopers. The same high quality as our field grey wool uniforms in the correct Luftwaffe Blue-Gray color, tapered legs and ties.